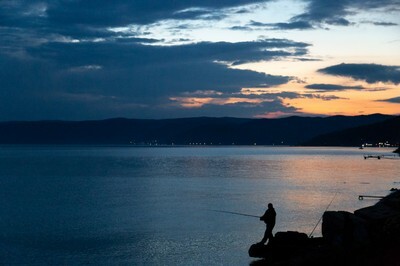 On our way to Lake Baikal, we have decided to make two short stops, Yekaterinburg and Novosibirsk. 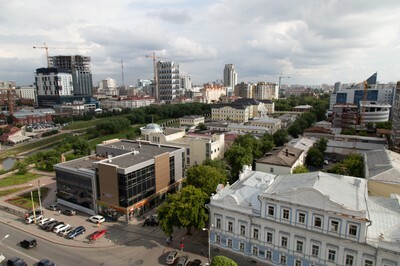 Yekaterinburg is famous for its mining and military industry, its many universities and for being the birthplace of Boris Yeltsin. 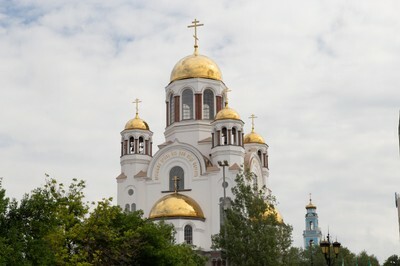 We have done a 3 hour walking tour with Mikhail, a geography teacher, and have seen many cathedrals, churches and government buildings. 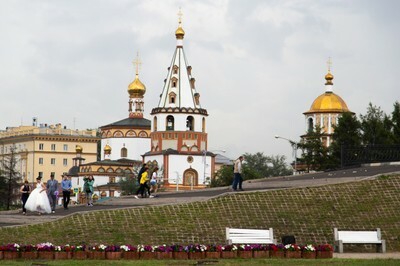 Of course, we also saw the place where the last Tsar and his family (the Romanovs) were brutally murdered by the Bolsheviks and where today the Cathedral on the Blood can be found. 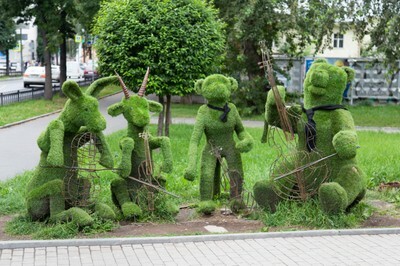 Their bodies were moved to St. Petersburg for an official burial in the nineties. 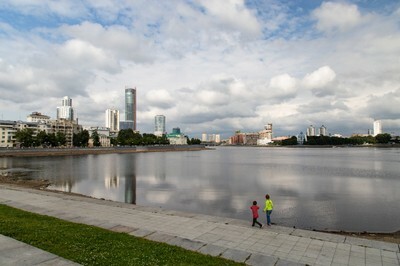 Overall, Yekaterinburg is a very industrial city, where people live from mining and are proud of military technology achievements and defense systems sold to countries all around the world. Given the fact that this city was closed to foreigners until 1989, we felt quite lucky that we could visit it now. The three segments on the train took between 20 and 32 hours each, so there was quite some time to spend there, but we did not get bored. It is in fact an excellent opportunity to unwind and do some things for which there is often not enough time, like reading a book. 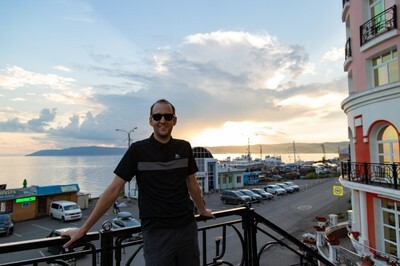 Apart from our guide books on the Trans-Siberian railway and Mongolia, Samuel was reading ‘Murder on the Orient Express’ by Agatha Christie and started reading ‘Doctor Zhivago’ by Boris Pasternak. Marta was reading ‘One Hundred Years of Solitude’ by Gabriel García Márquez. 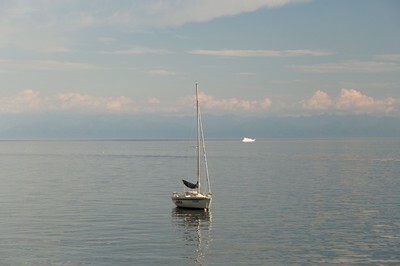 It is also a great chance to meet some fellow travelers. We were surprised how many people we kept meeting again and again, because they were visiting the same cities or happened to be on the same train and the same carriage as us a few days later. We also got in touch with some local people. 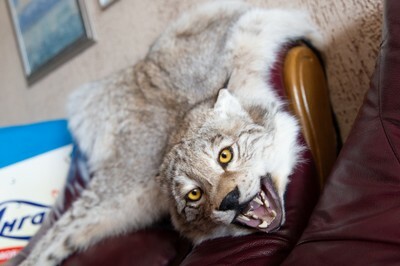 Between Novosibirsk and Irkutsk, Sam was in the restaurant carriage alone as Marta was not hungry and he got invited to drink Vodka by two Russians. They talked to him for almost two hours despite Sam understanding little to nothing of what they were talking. Besides some food and a lot of Vodka, they also gave him a cross to hang around the neck despite Sam’s best efforts to refuse the gift. Between Yekaterinburg and Novosibirsk we were travelling 2nd class and shared the compartment with a student of medicine who was returning home from a semester abroad in Slovenia. Being one of the best English-speaking Russians that we’ve met, he was kind enough to help us with all our translation-needs on the train. Every carriage on our trains had a dedicated attendant, or provodnista in Russian. The provodnistas check your passport before you are allowed to enter the train, they bring your included meal to your compartment (usually tiny portions of Beef Stroganov or Sausages), they distribute the bed linens and pillow covers and from time to time, you can see them vacuuming in the corridor. Surprisingly, despite there often being more foreigners than Russians in the carriage (at least in 1st class), our provodnistas never spoke anything but Russian. 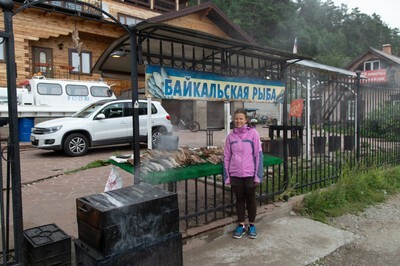 They are also in charge of the Samovar, a coal-powered water-cooker, where you can always get hot water for your tea, coffee or noodle soup. 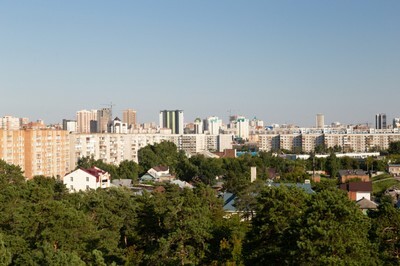 Our second stop, Novosibirsk, is the third largest city in Russia and the unofficial capital of Siberia. 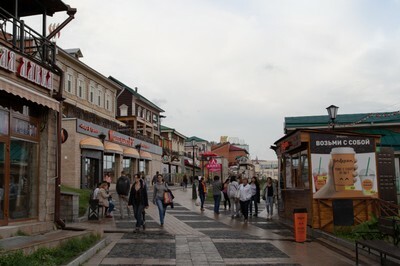 It was founded at the end of the 19th century when the Trans-Siberian-Railway was built, as a place for the workers to live. In just 70 years, it grew to 1 million inhabitants, making it one of the youngest large cities in the world. 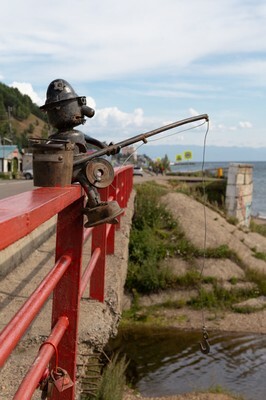 It is a very industrialized place, where most people work in engineering and heavy industries, like steel and machinery. It is proud of the famous Lenin statue with the coat blown by the wind and one of the largest Opera and Theaters in the world. After a short sightseeing tour, we decided to spend the afternoon like many middle-class families in the city and went to the extensive zoo. 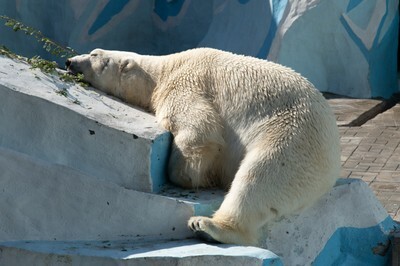 In the zoo we have seen a polar bear who visibly had enough of the warm weather and was resting lazily on the platform. 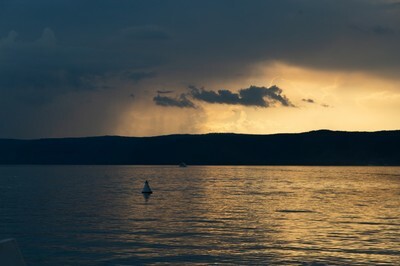 In the evening, we boarded our train to Irkutsk, which took almost 32 hours. 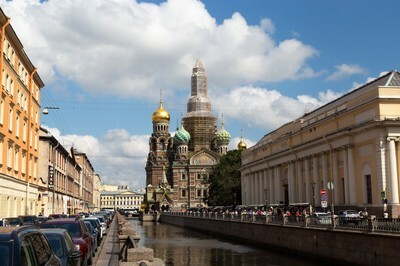 Sankt Petersburg is like a mature woman who knows her self worth and does not allow anything to influence her. She walks through all of Russian history’s troubles and still stays intact, there are no Lenin statues here, no red stars on top of the buildings (unlike in Moscow). We were quite lucky as the city experienced great renovations for its 300th birthday in 2010. So most of the buildings look nice and some renovation works still continue. 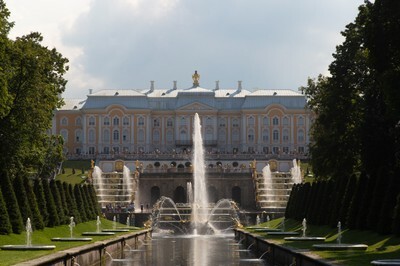 The Winter Palace, called the Hermitage, is a house of 3 million art pieces, but sunny weather encouraged us to stay outside. Instead we did a boat tour through the canals which remind one of Amsterdam. 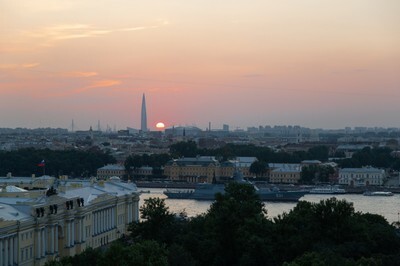 The dry and hot European weather reached Sankt Petersburg too and temperatures were close to 30 °C, unusually hot for the city at roughly the latitude of Helsinki, but we dare not complain as the city looked beautiful in the sun. 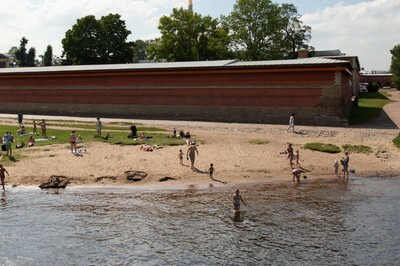 From our boat tour we saw the locals sunbathing and even swimming at the shores of the river Neva. Our hotel was located in an old tenement house resembling the house of Raskolnikov from Dostoyevsky’s Crime and Punishment, with big staircases and thick walls. Every time when walking down the stairs, you’d wonder which flower pot would fall on your head. In Sankt Petersburg we also had a chance to try the Georgian cuisine which is dominated by vegetables (especially beetroots), lamb, wine leaves, and pomegranate seeds. 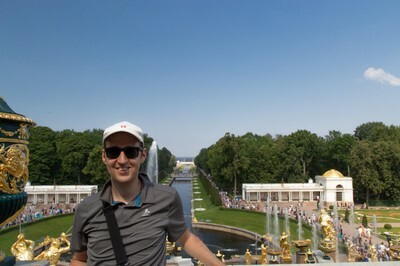 On our last day we went to Peterhof, the Summer palace of Tsar Peter the Great, who must have been a fountain-enthusiast, as more than 100 fountains of many kinds are spread throughout the vast gardens. Especially interesting was the Water Way which literally created an arch of small water droplets - very refreshing in the hot weather. 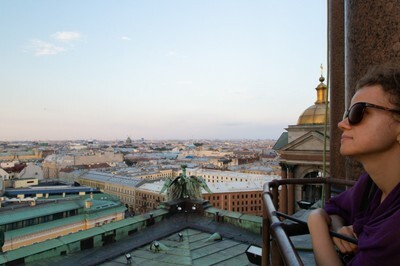 As our train to Moscow departed very late, we had the chance to visit the Sankt Isaac Cathedral colonnade at sunset, which provided fantastic panoramic views of the city and was the highlight of our stay in Sankt Petersburg. 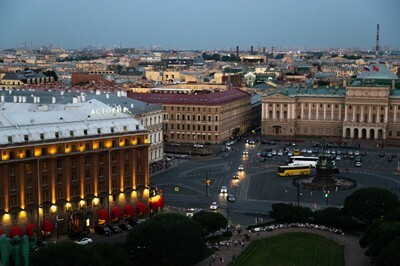 Half an hour before midnight we boarded the famous Red Arrow train to Moscow. 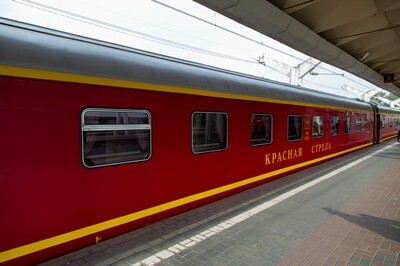 The Red Arrow was the first branded train of Russia, the first that aspired to be more than just a train. In its history, it has served many famous Russians like Lenin or Stalin in their need to move fast between Sankt Petersburg and Moscow. 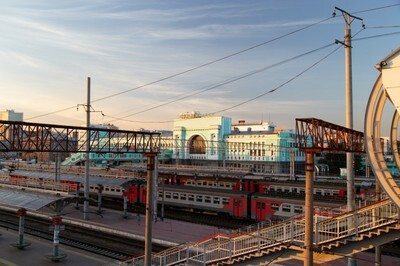 Nowadays, with its 8 hour travel time, it is far from the fastest connection between Russia’s two most important cities (the Sapsan train makes the same journey in 4), but it is nevertheless one of the nicest. We booked a first class compartment, so we had it all to ourselves. It was definitely the most luxurious compartment on our journey so far. Water, orange juice, bread and chocolate was provided for free, as well as slippers, towels and some toiletries. It was a big relief to take off our shoes and socks and put on the slippers, after a long day of walking around Sankt Petersburg. After ordering breakfast (which was included as well), we promptly prepared our beds, which were very comfortable, and went to sleep. Despite the luxurious interior however, the train rattled along the tracks like any other, which kept our sleep rather shallow. Still it seems a great way to travel since you do not loose any “productive” time, you go to sleep when you depart and you arrive just after finishing breakfast. At 7:55 AM, right on time, we arrived in Moscow. While Sankt Petersburg is an elegant city and Russia’s window to the West, Moscow was and remains uncompromisingly Russian. 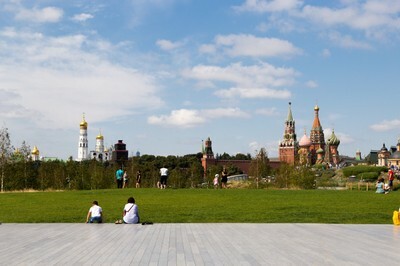 It all starts with the huge Red Square, proud Kremlin and St. 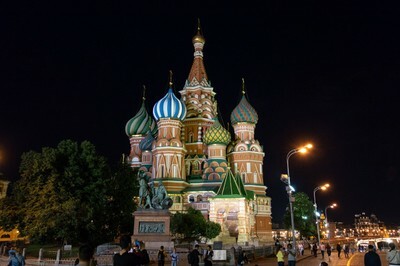 Basil Cathedral, and all other monumental buildings around, and ends with the Lenin Mausoleum and brightly lit red stars on top of each important building. 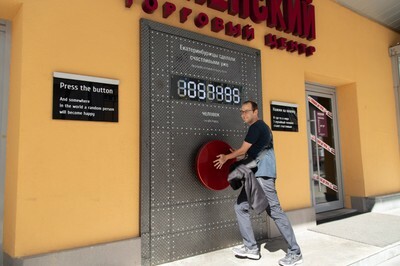 Our first two days were filled with sightseeing of the most important sights, including less touristy items like Arbat street where Bulat Okudzhava used to live and the Museum of Cosmonautics with a original-scale-model of a segment of the MIR space station and a 100m tall titanium obelisk topped off with a rocket. In the evening, exploring the city by night turned out to be a treat, with the Nikolailevska Street lit up with Christmas-like lights and the State Department Store GUM trying to imitate Harrods in London. 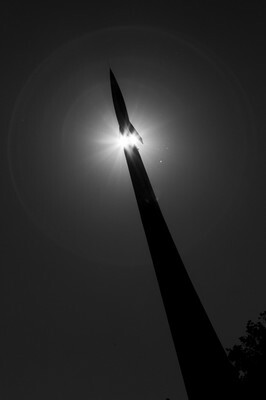 On our last day we woke up earlier to visit one of the strangest tourist attractions in the world, the Lenin Mausoleum, where the preserved body of the famous Soviet leader can be seen, notably against his own will and that of his entire family, who believed that the glorification of a single man contradicts the very core of the communistic idea. Stalin apparently didn’t care. 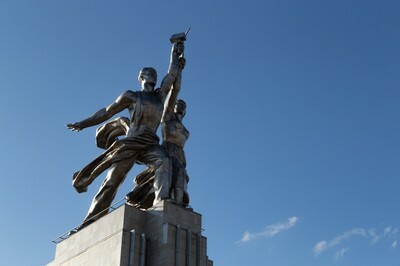 Everybody who knows Marta will understand that the only reason she went to see Lenin was curiosity. Curiosity was definitely not the reason for other guests, including several Chinese visitors who came and bowed several times to give glory to their hero. After waiting in line for 1.5 hours, we finally saw the great leader, who looked like a sleeping man and his skin resembled plastic. We read that his body is treated with many chemicals every year to prevent the decay of the body. Maybe that is why his skin looked like that of a mannequin. Many still debate if his body is true or fake. Guidebooks even say that his brain was in the past analyzed by a group of scientists to find out the reasons for his greatness. The institute was closed after several years and rumors say findings were not spectacular enough to be published.